The following is a Q & A we conducted a while back with Melissa. NRL News Today: After all these years, why did you write this book and what is the significance of the title, “You Carried Me: A Daughter’s Memoir”? Melissa: The title is very significant, as readers will likely gather before even reading it. My adoptive parents carried me in their hearts long before they held me in their arms. My birthmother carried me in the womb, and also in her heart, for many years. Of course, God has carried and will continue to carry me through it all. Why did I write this book now? Truly, it’s been a work in progress for close to ten years. After being connected with my birthmother a few years ago, the importance of this book became clear. This story was meant to be shared much further than speaking at events or blogging in the pro-life arena. NRL News: What are the most valuable lessons you learned about yourself, your extraordinary birth, and both families, the one that gave you birth and the one that nurtured and cared for you? Melissa: Not to sound like a cliché, but I’ve learned that love really is what this life is all about. Love transformed my life when I survived, love allowed me to thrive, love for the unborn and their parents brought me forward to share my story with the world, and love brought my birthmother and me together. My life story really is a love story. I’ve learned that we have to live out the story that’s been written for us. My birthmother is such a strong example to me of this. Of course, she wishes that things could have been different for her and for me, but she is thankful that I’m alive, that we’re in each other’s lives. We can’t rewrite the story of our past, but we are currently writing out our future. NRL News: You knew you were adopted, but not until your sister had an unplanned pregnancy did you learn that you had survived a 5-day prostaglandin abortion. The impact on you must have been almost beyond words. Melissa: I think this part of the book is probably the most difficult for me to have people read. But it’s such a huge piece of my life story and I haven’t spoken much about. It was absolutely devastating to find out that I survived an abortion. The depth of my pain and the lengths that I went to avoid that pain–to try and distance myself from who I am–was very difficult to write about. But I think needed to be shared. Not many people can understand what it’s like to be me, but I suspect many people can understand what it’s like to grapple with pain, your self-worth. NRL News: Many people have heard about your story or heard you in person. But, of course, you are hoping to reach a much wider audience. Who is that audience? Melissa: I would love to see people who identify themselves as ‘pro-choice’ pick up this book and allow themselves to see life and the issue of life for all through the lens of my experiences and my birthmother’s. There is a human element that too often gets lost, one that we all need to remember when we consider the impact of abortion. Abortion not only takes the life of an unborn child but can also be devastating to those who survive–the baby’s mother, the baby’s siblings, the mother’s extended family, and the baby’s father. NRL News: Tell me what the relationship with your birth mother has meant to you. Melissa: In reality, even though I had longed for such an opportunity to simply just meet her, I had long given up hope of that ever happening. And here we are, now a part of one another’s lives. It’s an incredible gift. Almost indescribable. What I can say, though, is that our relationship has given me renewed strength in this battle to protect children and women. It’s also impressed on me the importance of reconciliation in all relationships. I want everyone to experience the love and strength that my birth mother and I are experiencing. NRL News: As you reflect on all your life, do you have conflicting thoughts about God’s role? Melissa: I don’t have conflicting thoughts on God’s role, but I certainly have questioned Him more times than I can count about what He’s doing, or where He was at a certain point in time. I’m quite sure I’m not alone in that. What I’ve come to accept is that He’s always there. He doesn’t cause suffering (living in the broken world that we do causes that), but He is always there to comfort us, guide us, and yes, as my title relates, even carry us. NRL News: If you will allow me, we will talk further about “You Carried Me: A Daughter’s Memoir” after the book is officially released. For now, if you had one take-away for the reader, what would it be? Melissa: This is a deep question and the first time I’ve been asked it! If there’s one take away for the reader, it would be that even when something that we experience doesn’t make sense, even when we experience hardship and suffering, there will come a point in time that it will make sense. There’s an old proverb–“God writes straight with crooked lines.” All of the crooked lines in the story of my life have been straightened, and it really is an amazing thing to read. 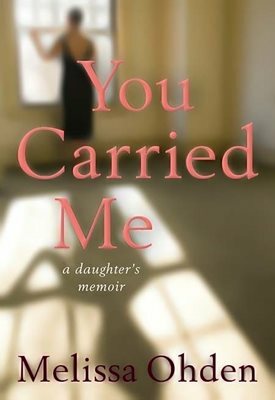 NRL News: How can NRL News Today readers order You Carried Me: A Daughter’s Memoir? Melissa: The readers of NRL News Today can visit www.plough.com for more information about how to order.